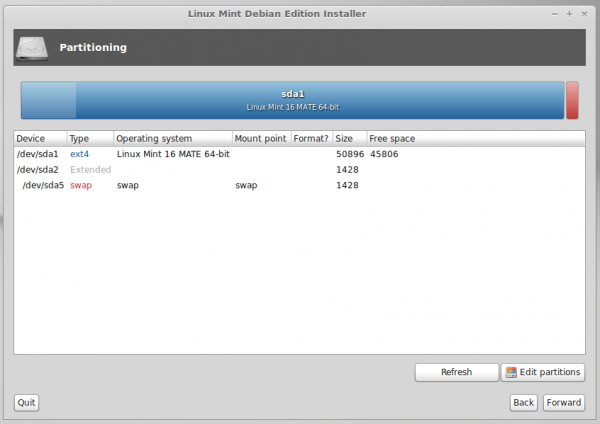 Linux Mint Debian Edition 201403 review presents a review of the latest release of Linux Mint Debian, a distribution from the developers of Linux Mint. 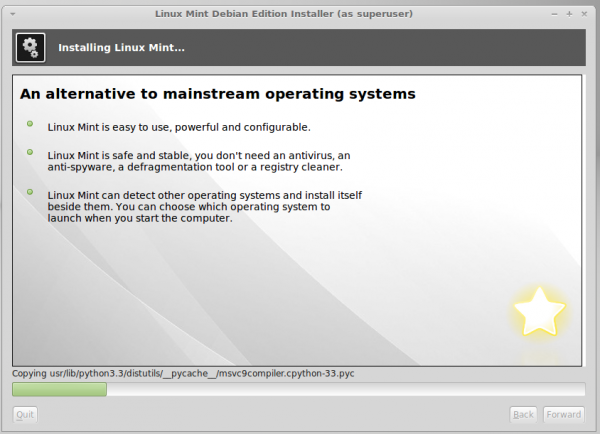 As its name suggests, Linux Mint Debian is based on Debian (Testing), so it’s not compatible with Linux Mint, which is based on Ubuntu Desktop. 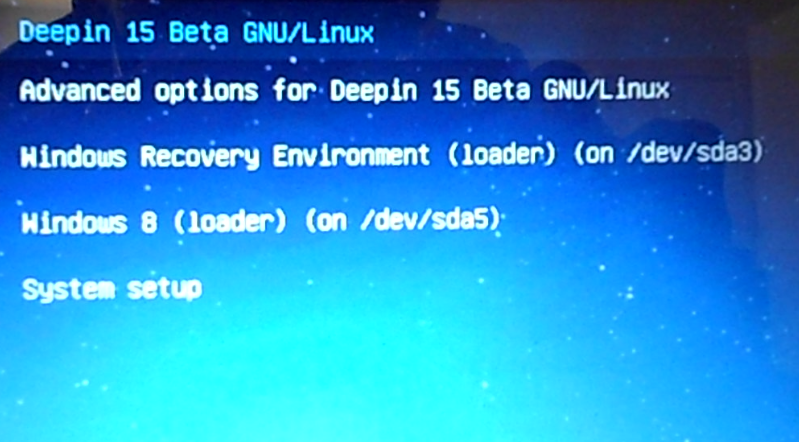 In the next section, I’ll point out the weaknesses of the Linux Mint Debian 201403 installer. The Linux Mint Debian 201403 installer has a graphical interface, but user-friendly is not a term I can use to describe it, because it is anything but that. 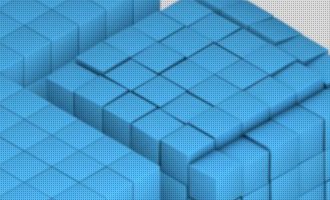 This screenshot is of one of the slides in the slideshow at the tail end of the installation process. The last item in the list proclaims that “Linux Mint can detect other operating systems and install itself beside them.” Not true! 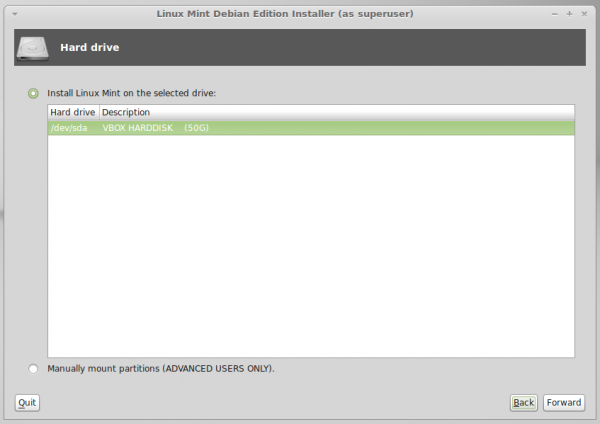 Not the installer of Linux Mint Debian 201403. The slide must have been reused from the one used on Linux Mint. For sure, the installer can detect a hard disk, but that’s just about it. 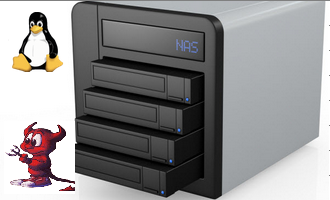 It cannot install itself beside other operating systems on the target hard disk, because to be able to do that, it will need to have a completely automated disk partitioning mode – a feature it lacks. 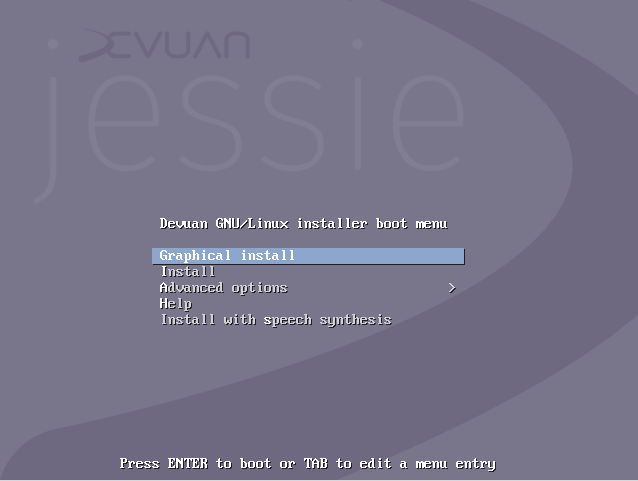 This screenshot, which was taken during an installation attempt on a virtual system with an installation of Linux Mint 16 on the target disk, shows what’s supposed to be the Installation type step of the installer. 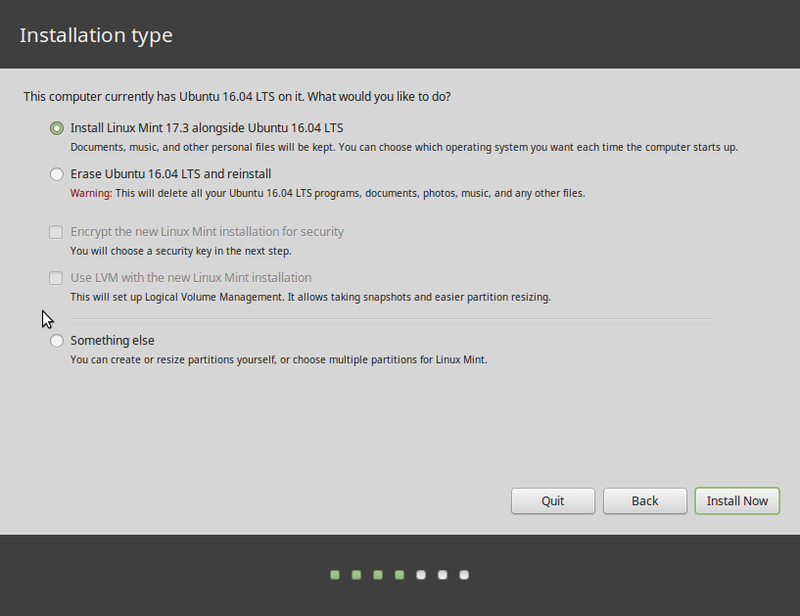 There are no options like you’ll find on the installer of Linux Mint. This screenshot is the next step after clicking the Forward button in the step shown in the image above. The installer didn’t even attempt to partition the disk. so manual intervention is called for here. If there are no other operating system on the target disk, it will actually partition it (the disk) automatically, but is unable to assign what’s supposed to be the root partition a mount point. That means the task of assigning the partition a mount point becomes your responsibility. It’s a very simple thing to do, but it just goes to show that the installer of Linux Mint Debian 201403 can “detect other operating systems” on a hard disk, but is unable to “install itself beside them” automatically. 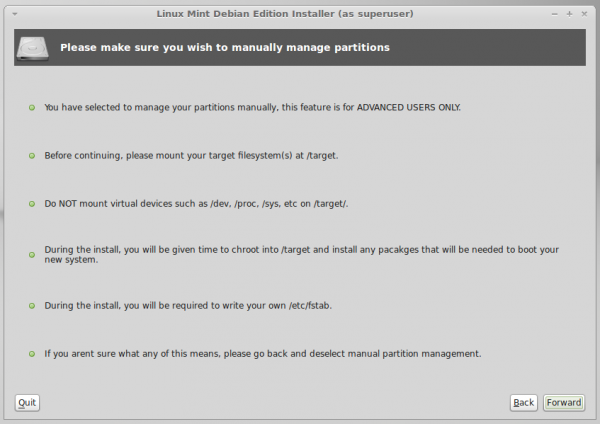 This screenshot shows the message the installer throws if you attempt to proceed with the installation process without first identifying which partition should be the root partition. And this one shows the available filesystem options. 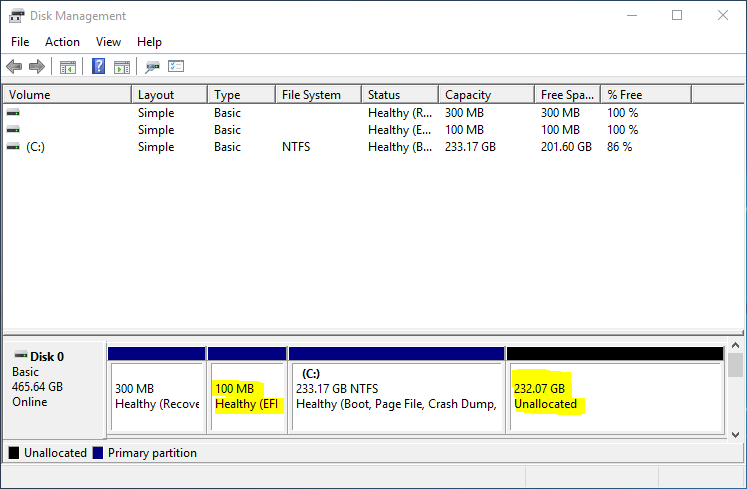 If you examine the second screenshot (counting from the top) of this article, you’ll notice that there’s a Manually mount partitions (ADVANCED USERS ONLY) option at the bottom section of the image. You’d think that selecting that option and clicking the Forward button will take you to the manual disk partitioning tool. But you’d be wrong. It just brings up the information window shown in this screenshot. And clicking the Forward button will bring up this window. In other words, it does not open the manual disk partitioning tool. 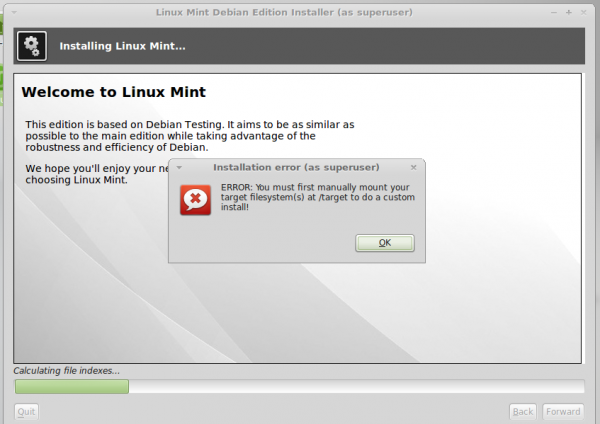 Maybe it is not supposed to, but that makes installing Linux Mint debian even harder for new users. 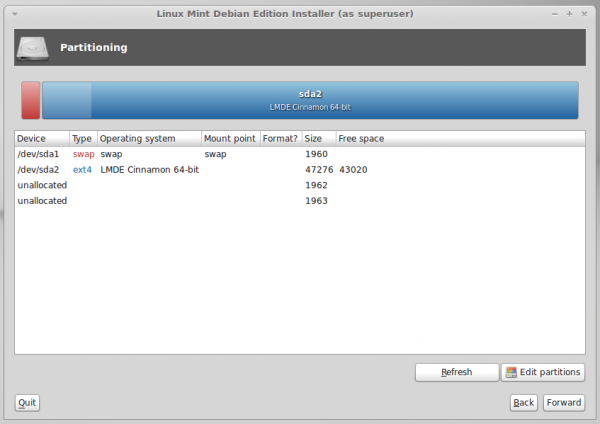 If you manage to get past the installer and install a copy of Linux Mint Debian 201403 successfully, you will actually have a good desktop operating system that, for the most part, just works. 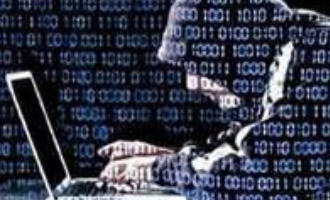 And it will just work because most of the applications you’ll need for your daily computing tasks, including proprietary multimedia codecs, are installed by default. The only set of applications not installed, are games. Not a single game application is installed, but that seems to be the tradition with both lines of Linux Mint distributions. Unlike other Debian-based distributions which tend to use IceWeasel as the default Web browser, Linux Mint Debian 201403 gives you the real thing – Mozilla Firefox (IceWeasel is a fork of Firefox). And the very latest too (Firefox 27). 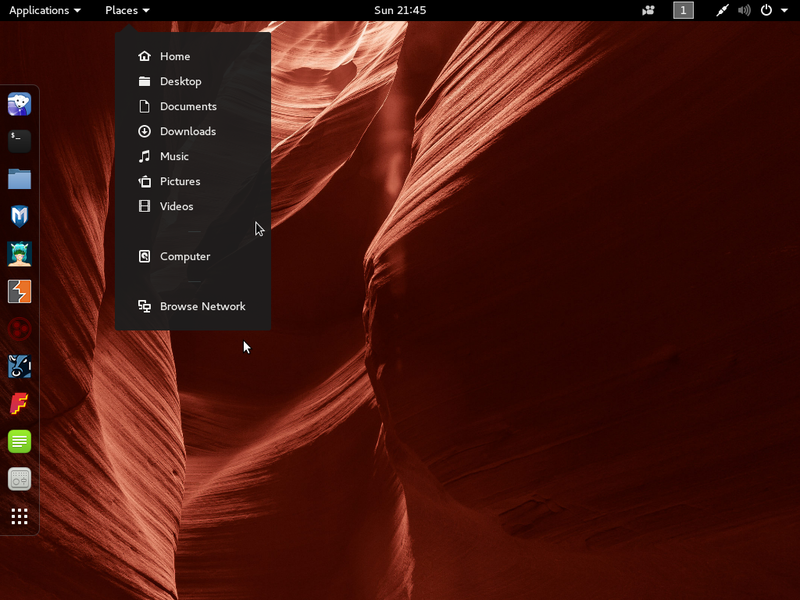 And unlike on Manjaro, a desktop distribution based on Arch Linux, both desktop flavors of Linux Mint Debian 201403 released (Cinnamon and MATE) have similar applications. The welcome or greeter application, for example, is the same on both desktop flavors. Same with the installed graphical package managers and other installed system management applications that are not specific to a particular desktop environment. So if you switch from the Cinnamon to the MATE edition, the primary system management applications you will be using that are not specific to each desktop environment will likely be the same. For those new to Linux Mint Debian (and Linux Mint), the screenshot below shows the main interface of Software Manager, the main graphical package manager installed on both flavors of Linux Mint Debian Edition 201403. 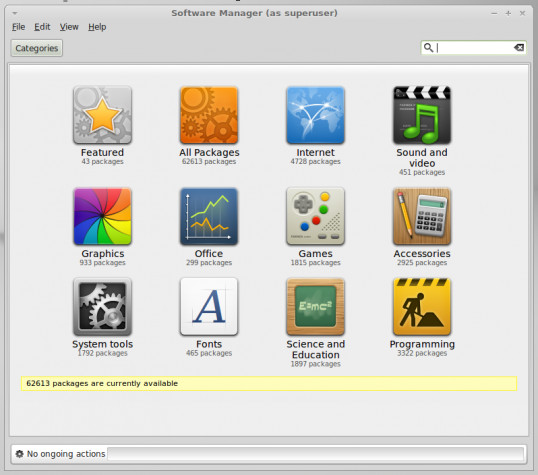 A much older graphical package manager called Synaptic Package Manager is also installed. The next sections present screenshots from test installations of Linux Mint Debian Cinnamon and Linux Mint Debian MATE. This is very misleading review. But still it is not incorrect. 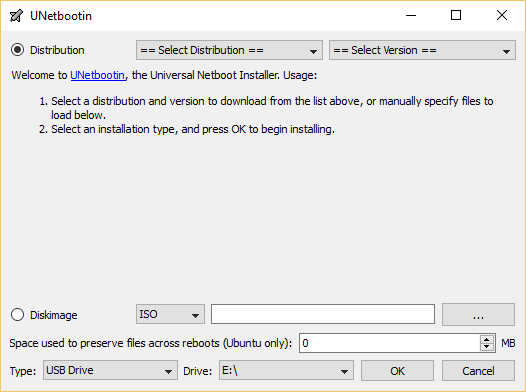 It does find other Operation systems and install along side with a boot menu which lets you choose which system you wish to use. Of course you must have some basic knowlage of disk paritions and I agree the installer could explain more clearly about assining “/” , “home” and “swap”. But most new users have a single disk and singe partition and just as installing windows hit “ yes” to each stage and it all gets done for you. I switched to LMDE some 4 years ago and have found it to be by far the best distro for anyone knows nothing. Boot from stick or DVD and all you need to do is type in wifi code ( if not on LAN ) and you can use everything out of the box. Install may require a little bit of help but so do many people installing windows. 99% of the time you don’t need to install any drivers and to work with the software manager is now as easy as google play for andriod with one exception every thing is free with no in app purchasises! Anyone I know that has XP, I tell them to just install LMDE with cinamon desktop. Only hear positive feedback and as far as updates go, I only have to say “ yep you can do it” that or 10 mins on teamveiwer and there good to go……..
As for the firewall …..I never use one if im behind a router with one built in anyway ! 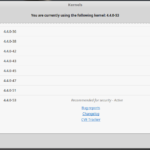 But I do have to agree that a GUI for a firewall that is added in the install would be a good thing ( OFF by default ). Games …..hummm there are so many to choose from I don’t see which if any should be there by default …and just a few clicks in the software mangager and you can install one in seconds and play with out a restart. And as far as which apps are already there, well most home users don’t need more then whats there! All in all you raise a couple of good points but missed the target completely……. LMDE is fast, plays almost all media content, never needs to be reinstalled or cleaned up and all this out of the box for free! The Dude who wrote this “article” is a complete dumbass. He has no idea about LMDE and its Pro’s. What a N00b! That “dude” is me. What was it about the article that you disagreed with? All that to support the author for not trying a right-click? 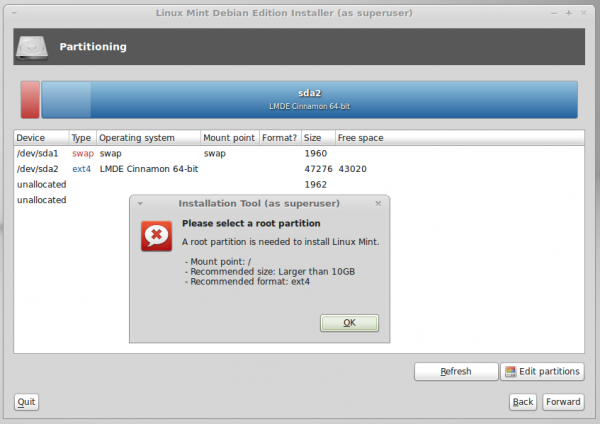 It’s not as if the inexperienced users would manage to install LMDE (or another OS) without messing anything up considering you have to know what partitioning is, but if you know that stuff, chances are it will cross your mind to perform a right-click where it’s needed. The installer can clearly be improved but to complain about some as simple as that… it unnecessarily dumbs down a review. LMDE 201403 is awsome. It just rocks and I’m an LMDE user for the past more than 3 years and I love LMDE. Minor issues may be there but then also it has improved a lot over years and getting better day by day. 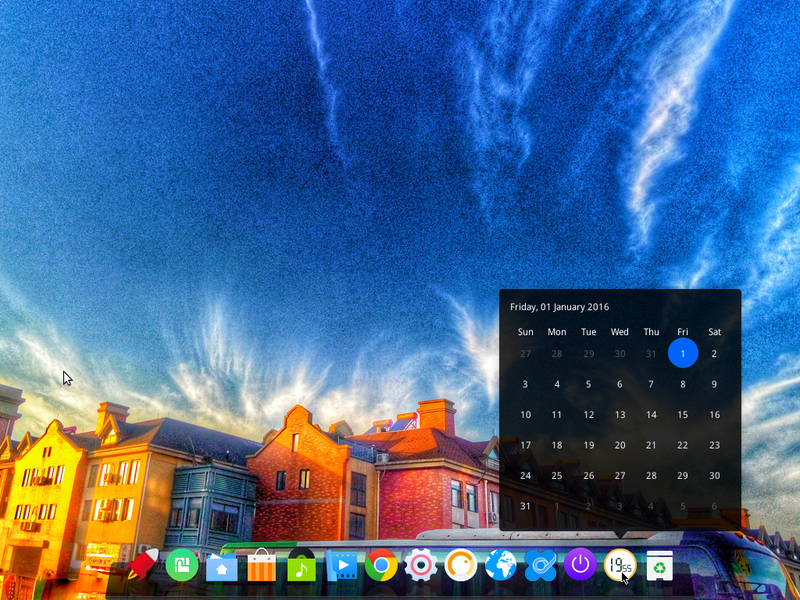 lmde is the only desktop operating system i know that really works as rolling release. Ubu upgrade to the next release only works when you don’t change anything in the meantime, so not usable. Didn’t try the standard Mint releases, but I doubt, as it is based on ubuntu. lmde rolling works here in the family now for 2 years without any upgrade problems. So, can you offer an other rolling release desktop operating system working without any problems for more than two years? Looking for a true rolling-release distribution? Try any desktop distribution based on Arch Linux. 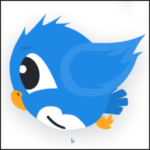 Antergos and Manjaro are good examples, though each has its pros and cons. I could also throw in Chakra in there, but it has more cons than pros. LMDE gives you twice a year ~1.2GiB of upgrade that really works without any problem over years. Security relevant stuff will be delivered when available. ANY archbased distro I tried up to now breaks at lest twice a year, delivering a brick. Hmm, I’ll have to agree for the most part with finid on this one. If you want a truly rolling Debian distribution there’s nothing better than rolling with Unstable/Sid. LMDE is only half-way house and quite pointless in my view, but I understand that there are people who are more comfortable with a more managed process. If addressing that group one would think a friendlier installer would be a high priority. 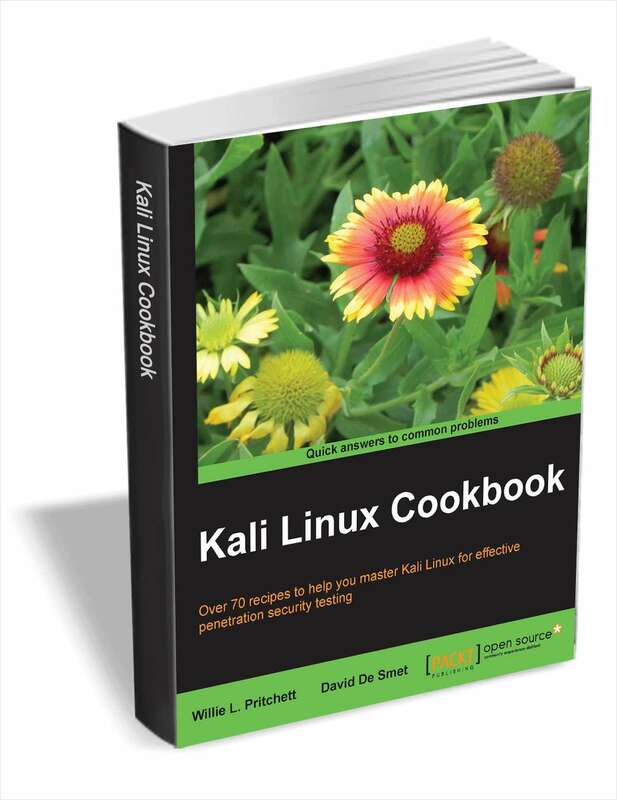 So far, only Kali Linux is the only one I’ve come across that uses the DI. I think Crunchbang Waldorf is using it, only rebranded with their own banner. LMDE is an approachable Debian distribution with the polish of Mint and without many of the less desirable choices made by Ubuntu. Agree it is not ideal for new users.